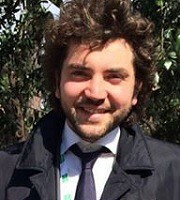 Claudio Zulli, MD, from the Gastroenterology and Digestive Endoscopy Unit, NOCSAE Hospital, AUSL, Modena presents this video case. A 58-year-old man was referred to the Transplant Unit for an “urgent” orthotopic liver transplantation (OLT) due to decompensated alcoholic liver cirrhosis. Abdominal ultrasound (US) and a CT-scan revealed a mild left intra-hepatic biliary duct dilation and an incomplete portal vein thrombosis. Cholangio-magnetic resonance imaging (MRI) confirmed the dilation of left intrahepatic ducts and revealed a partial stenosis of the right intrahepatic biliary duct at hilum that was suspected for malignancy. The patient was referred immediately to our Endoscopy Unit with the specific request of obtaining histological characterization by biliary brushing from the stenotic tract. An ERCP was performed and the contrasted cholangiography confirmed the dilation of left intra-hepatic ducts. Moreover, 2 sub-stenosis of right intra-hepatic biliary duct at the hilar bifurcation and about 2 cm above the hilum were revealed. Based on suspicion of malignancy but not completely confidant with the diagnostic hypothesis of malignancy, we decided to perform a single-operator peroral cholangioscopy to directly visualize lumen of biliary ducts. 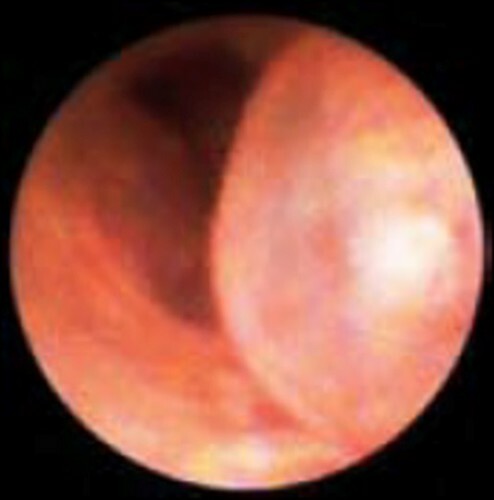 The cholangioscopy revealed 4 choledocal varices with red mucosal spots localized into the CBD (misdiagnosed at previous ERCP and other imaging techniques) and a benign sub-stenosis of the right intra-hepatic duct at hilar bifurcation. Moreover, the presence of a sub-stenosing biliary varix was revealed after the progression on a guidewire passed into the right hepatic duct under cholangioscopic view. Figure 1: A common bile duct varix with red mucosal spots. the importance of performing a single operator peroral cholangioscopy in patients with “suspicious” biliary strictures. The presence of biliary intraductal varices must be always considered in patients with portal hypertension and radiological evidence of indeterminate biliary strictures. Single operator peroral cholangioscopy is an adjunctive tool to achieve a correct diagnosis in these kind of patients.